I have a love for Lillian Gish’s work so strong that it approaches prejudice. She’s my favorite actor, and the promise of seeing one of her performances is enough to make me watch anything she’s in. But, when I do, I often find the actors around her, the sets—the whole movie, even—blurring into the background. Gish did not work in a vacuum, but sometimes, that’s how I remember it. Not with La Bohème. It's not the best film Gish ever starred in, but the rest of its cast, and its director, were as game as she was. King Vidor, whose interest in poor and hopeless souls reached an apocalyptic peak with The Crowd (1928), here delivers something intermittently light. John Gilbert is perfectly cast as Rodolphe, a playwright who has barely a franc to his name, and seems exhilarated by that fact. Gilbert, an actor with real charm, seems almost balletic in his big scenes: standing well-poised and straight; his form tapering to a thin waist; his footsteps light. He is Carelessness. Gish, as Mimi, is Concern. She’s an embroiderer: poor like Rodolphe, but worried about it. This is a typical Gish role, in the sense that she plays a woman who suffers greatly, but persists, thanks to the strong spirit inhabiting her weak body. Oh, the things she does. I’ll describe just two. First, there's Mimi’s trip to the pawn shop, where she spills a bundle of goods on the proprietor’s table—an amazing piece of pantomime, as Gish manages to attach a split-second’s worth of meaning to each object as the man casually flicks them aside. The pace of this bit makes it comic, but the intensity—and range—of different reactions Gish delivers, using her eyes and mouth, shoulders, arms and hands, makes it moving, too. The second example, also ostensibly comic, occurs soon after Mimi and Rodolphe meet. Mimi arrives at her neighbour’s apartment badly chilled, and so he offers to let her warm herself by his stove-pipe. There’s a fairly obvious joke here (one Vidor intended, I think, since he gives a lot of screen time to a packing tube and loaf of French bread later on); but that’s not the point of the scene. The point is to sexualize Mimi without compromising her character. Even covered neck to foot, wearing a shawl, she must envelop the stove pipe to get all of its heat, and then, turn around to warm her rear. And when she does that, arching her back and turning up her face, there’s something a little Garbo-esque about Mimi. This is all great silent acting, of course. But what’s more interesting to me is that both scenes have a 'beat' to them. In the first, Gish is composing with short notes; in the second, with long draws of the bowstring. They were adapting opera here, after all. The music has to come out somehow. Combine these scenes with the totality of Gilbert’s performance and you see how Vidor proposed to do it. Other elements, though, feel stagey. The bohemians’ living space is gigantic, or at least it looks that way, as if theatrical width were needed for a film with no dance numbers or otherwise complex choreography. Rodolphe’s friends are painted a bit too broad for a film from the mid-20s. And the costumes, especially for the women, are outsized and garish. They look wrong on Gish. Actually, joy looks wrong on Gish. And maybe that’s why, as La Bohème wore on, I began to care less about Mimi. If you know the plot of the opera, you know that joy, for her, is fleeting, but there is a point, about in the middle, where she has a lot of it. Gish gives us that joy. But her swooning over Gilbert comes off as cheap. A cynic would say she had no gift for light comedy. Being prejudiced, I prefer to think of Gish as having created a character too full, too nuanced in her fears and goals, to be as air-headed as the rest. Maybe I should believe in the power of love instead. But frankly, I couldn’t believe that Mimi believed in love. Though Mimi is pursued by a drooling Viscount, who manipulates his opera glasses like a probe, she remains above reproach—a more virginal character than I understand her operatic counterpart to have been. The sexual politics thus simplified, the film can only concern itself with whether Rodolphe and Mimi will find happiness; which, in a film like this, really boils down to whether or not Mimi will die. I haven’t seen Gish die very often, but, it should be noted, she can collapse like nobody’s business. I saw La Bohème live, as part of Revue Cinema’s Silent Sundays series, organized by Eric Veillette. Accompaniment was provided by William O’Meara. ***Can't get enough King Vidor? No, of course you can't. Read my posts on The Crowd and his super-rare 1920 film, The Jack-Knife Man. First just to say I really do like you're blog a lot, lot's of great reviews! I like Boheme too, though I'd originally watched it as a fan of John Gilbert (who I have to admit was a little overpowering in this one compared to some of his better performances). It wasn't until I finally saw The Wind that I realised what a great actress Gish actually was. Now, I'm with you. She's excellent. I've only seen La Bohème once, and I'm going by a memory that's over a year old, but I enjoyed your review, and I agree with a lot of your points. I, too, have problems with Lillian Gish's Mimi. She has some good moments and one great moment (the death scene), but mostly she seems self-miscast. You're right that she acts too virginal for the role. On stage and in the novellas, Mimi is a coquette. The Mimi we mostly see onscreen is typical of Gish's persona--the smart, suffering, but still feisty waif. She seems like an American trope dropped into a southern European culture, and I wonder how she survived there for so many years without absorbing or adapting to the culture she lives in. If Gish's Mimi was a coquette like in other adaptations, she should seem worldly and deft at handling men, especially in relieving them of her living expenses or fending them off without offending them or acting fearful of their advances. 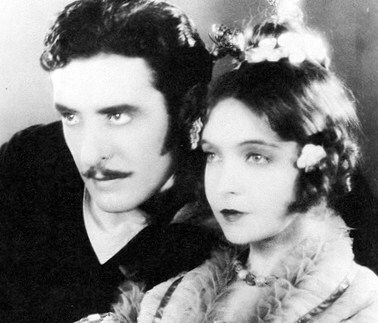 Gish's Mimi mostly does not act this way, so the moment when John Gilbert's Rodolphe accuses her of a dalliance with the Viscount, he seems like an abusive, paranoid boyfriend versus a rightly suspicious lover. For me, there's on moment in which Gish gives a hint of the Mimi she could have played. It's when the characters go on the picnic, and Rodolphe lies across her lap. While she's stroking him, a worldly smiles appears on her face for one moment. It's too bad that Gish was not as comfortable portraying that Mimi throughout the film. I suspect a lot of people forgive her shortcomings in the role due to her death scene. She is the queen of cinematic suffering in that scene. Her Mimi manages to die beautifully in look and manner while also looking pathetic and frail. It's romanticism and a strange realism all at once. I agree with you that Gilbert was perfectly cast. Some people like to say he wasn't as subtle in this role as in other performances, but that's the point. He altered his acting for the role. He's playing a bohemian writer in the Latin Quarter, so he's not going to portray an "American" type or show those mannerisms. It's just that his full bodied portrayal contrasts with Gish's when hers should have complemented his. That was an interesting review. I agree that Gilbert overshadowed Gish in this one. She wrote that for the death scene she went for a long period without drinking anything so that she would look suitably bad. It worked. And you're right, the Bohemians' garret was way too large. Thank you for sharing. I loved how you analyzed so carefully the two scenes. I loved this movie, despite being sad, and agree that all the cast is great, especially Gilbert, even though I decided to watch this because of Lillian. Very good write up of this film, which isn't one of the best that Gish appeared in but interesting nontheless. As for comedy, I think her best somewhat comedic performance is in True Heart Susie, where she projects a very wide range in that one. Wow! I loved your review and I think I would like the movie just as much. What a wonderful contribution to the blogathon. Your descriptions of Lillian's scenes are so vivid, I feel I've actually watched them.